Owen Hatherley: "Garden Bridge's cancellation provides an opportunity"
Now that the Heatherwick-designed Garden Bridge has been officially scrapped, its time to think again about what London really needs, says Owen Hatherley. 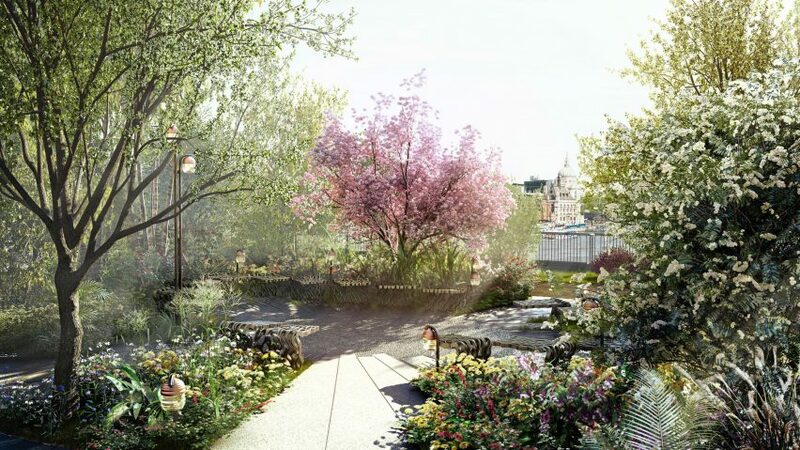 The cancellation of the Garden Bridge is one of those rare and precious moments where concerted campaigning, from a variety of groups, over several years, has managed to have a decisive effect. In the built environment, this doesn't happen often, thanks to a planning system that is fundamentally biased towards the interests of developers, and with local democracy and public participation that is residual at best. The Garden Bridge managed to be offensive on so many levels – stylistic, political, financial, environmental – that it antagonised a large enough group of people to manage to stop it, something that was not the case for its precursors in vacuous tourist urbanism, such as the ArcelorMittal Orbit, the Emirates Air Line and the "Boris Bus". Unlike many of the more egregious things planned in the British capital, it was to be right in the centre of London, barging its way across two of the city's most pleasant public spaces. What a mortifying thought, this galumphing, grinning structure, with its high-security gates and ground-floor retail concessions, its fluted golden mushroom columns and bushy oaks, interloping itself between the National Theatre and Somerset House, right into one of the finest and most admired views in London. That may have been what eventually did it for the project. That, and its labyrinthine financial opacity. But the demise of the Garden Bridge leaves open another question. As Douglas Murphy demonstrates in his superb Nincompoopolis – The Follies of Boris Johnson, all the public projects that were embarked upon in London between 2008 and 2016, initiated by the former mayor, were attempts to increase what is usually called, with considerable grammatical ugliness, the capital's "offer". Murphy puts this down to a certain unease about the relative merits of London as compared with New York, or Paris. We all know that London doesn't really do spectacular vistas, great axes or grandiose civic buildings. Its royal palace is a joke, its baroque cathedral is surrounded by bombed-out precincts, and its vernacular architecture is generally municipal and brusque. Each one of those silly, badly conceived, "wow!" projects was a way of keeping tourists coming, and making the city constantly desirable to a trans-national capitalist class whose members might otherwise think, when going back to a tiny flat in Hackney, about the fact that they could live in Manhattan – Manhattan! – for the same amount of money. On that level, when taken out of the specific eccentricities that went with the Garden Bridge – the famous friends, the fraudulent competitions, the unspecified financing, the moronic, relentlessly privatising approach to urban design – the ideas behind the bridge could easily outlive the unlamented administration of Boris Johnson. A certain idea about London is dominant among a generation of politicians that came of age in the 1980s, when the city was – outside of the always wealthy Mayfair-Belgravia-South Kensington belt – a deindustrialised, depopulating city in serious trouble, with very similar problems to the post-industrial cities of the north of England. Even left-wing politicians like Ken Livingstone came to argue that what London needed at all costs was private investment, more people moving to and working in the capital, and a build up of employment opportunities in the city. It is fair to say that in this, they succeeded beyond their wildest dreams. One unexpected upshot of this is that rather than being comparable to Newcastle or Liverpool in its trajectory of grandeur and decline, London is the immensely rich and influential capital of an increasingly poor and internationally ridiculous country. In brute economic terms, it is a city at the very top of the First World, in a country whose cities are otherwise on the level of the former Second World, with Swansea or Glasgow having more in common with Riga or Bucharest than they do with London. All London politicians appear to agree that this is a good thing. London's population must go up! Crossrail 2 must occur! The Bakerloo Line must go to Camberwell! At the same time, London is the only city in the country with an integrated transit system, while the government refuses to even electrify local rail lines elsewhere. This is the mentality that led to people thinking the Garden Bridge was a good idea in the first place. It is desperate, foolish, and it needs to stop, not only because it is awful for people in the North or in Wales, but because it is awful for Londoners, who have to cope with an increasingly overwhelming pressure of overcrowding, an overheating economy, outrageous rents and house prices, and a sense that every single inch of space is for sale. What would be welcome, from London's politicians, and its mayor, is a total break with this mentality. Yes, a mayor's role is to defend a city's interests. But Londoners' interests are simply not being served by treating the capital as a bloated and bumptious real-estate fun park. They would be better served, firstly, by co-operating with Manchester, Liverpool, devolved Scotland and Wales, to build up rival centres that can take some of the pressure off the capital. They would also be far better served by shifting the emphasis from growth at all costs to building a fairer, decent city for the people who live in London, who badly need better air quality, the mass building of council housing, legally binding rent control, and to feel that they actually matter in the planning process. So far, new mayor Sadiq Khan is avoiding the grossest excesses of Boris Johnson with impressive restraint, cancelling the baubles, making transport cheaper and easier rather than more expensive and more difficult, and promising strict regulation to enforce more "affordable" (a weasel word, to be sure) housing. But then, we find him cheerleading schemes such as a noxious North Greenwich project by a multinational consortium, designed by Santiago Calatrava – an architect whose flagrancy with budgets and structural integrity makes him Heatherwick's only real rival. It's not good enough. The Garden Bridge was a horrible image of the kind of city London could become, but that city might not happen and not look as nails-down-a-blackboard hideous as that design. It's the ideas behind that justly vanquished scheme that were the problem, every bit as much as Heatherwick's excrescences. Its cancellation provides an opportunity to rethink, and it mustn't be wasted.